Between St Girons and Tarascon-s-Ariege lies the Col de Port (south of Foix) along the D618. This is a fabulous ride. If you are in the area, or traveling between areas, at the very least, let someone out of the car to ascend and descend this climb. Where else will you see a profile like this? The color blue = fun! 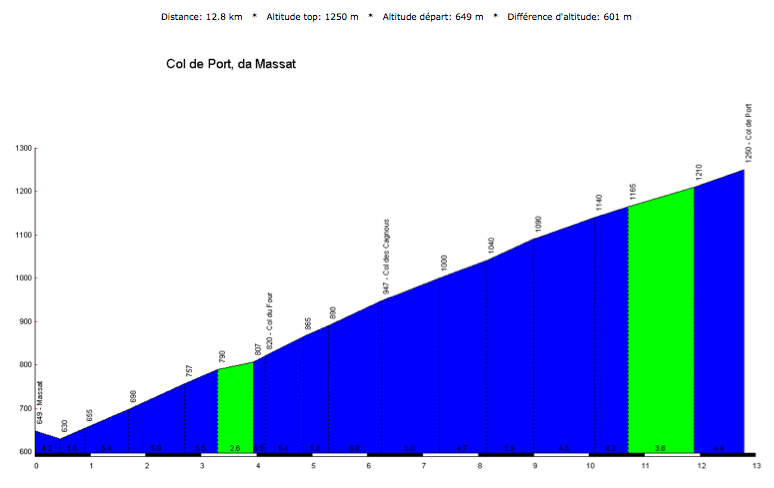 This year the Col de Port is not included in the Tour de France, but it has been in years past. In 2010, Stage 14 of the TDF travels just to the east from Revel to Ax-3-Domains. And then again during Stage 15 of the 2010 TDF the route travels from the north in Pamiers, just to the west and south to Bagneres-de-Luchon. Col de Port is in the middle of all that excitement. Picture of the day: the view from the cafe at the top of the Col de Port. Over to the right I could see the mountains of Andorra and Spain. *By the way, the Auberge (between Biert and Massat), Les Deux Velos serves lunch, so if you are riding or driving by, you may stop in for lunch or a drink. It is not signed as a cafe, but walk through the bike gate, knock on the door and ask Elma or Mark.